Facebook is a powerful force in advertising. Once considered a luxury tool among online advertisers, Facebook’s ad platform is a necessity to reach a large-scale audience on par with audiences reached via Google Ads. Facebook reported making more than $9 billion in ad revenue in the second quarter of 2017, an increase of 47% from the second quarter of 2016. That’s not chump change. When you ask business owners how they spend their advertising dollars, Facebook ads are bound to come up. Unfortunately, many businesses are making 3 major mistakes that cause them to fail miserably at advertising on Facebook. Facebook is a great equalizer in the world of digital advertising. Businesses can be conservative and spend as little as $20 to promote their brand, or they can pour millions of dollars into the Ad Manager. Unfortunately, for many businesses without dedicated marketing teams it is easy to spend money just to tread water. By understanding the 3 biggest mistakes, you have a great chance of avoiding money-wasting sinkholes that can break any campaign. 1. Clicking “Boost” Without Putting Any Audience Targeting Into Place For the Campaign. Facebook is notorious for promoting the “Boost” button every chance they get. Without much information about what a boost does beyond sharing your post with more people, it seems like a solid way to start your venture into Facebook advertising. The reality is that when you boost a post, in order for it to actually do anything, you need to treat it like a marketing campaign. You shouldn’t just go boosting posts without first targeting an audience. When you have a high-performing post, Facebook will ask you if you’d like to boost it to potentially reach thousands more people. 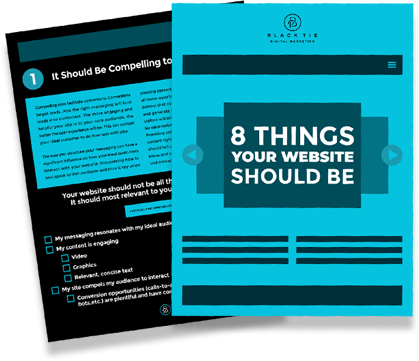 You can define your boost’s goal to get engagement, clicks to your website and messages. You can also define the demographics that will receive your boosted post. If you just go with the defaults, you’re throwing money away. You need to target an audience. You need to ask yourself what you want this audience to do with your post when they see it. 2. Failing to Understand that Boosting Posts and the Ad Manager are Two Different Things. 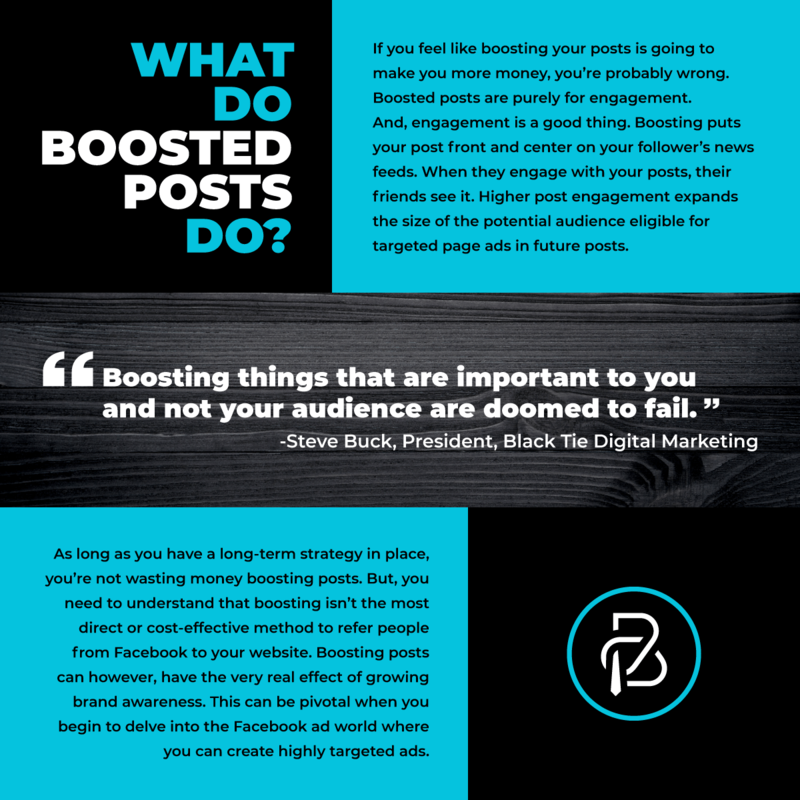 When you view a boosted post – and the comments and likes that follow – through the lens of branding you may not realize that with higher post engagement comes better odds that a future post will be noticed in a fan’s newsfeed. OR, that higher post engagement expands the size of the potential audience eligible for engagement-based targeted ads in future campaigns. Facebook boosting and advertising are two marketing tools that work in tandem to expand your audience and compel conversions. Well Then, What are Facebook Ads? Facebook ads send highly targeted messages to the audiences you select. They are used to compel an action, like clicking through to your website, sending a message or shopping. Their goal is higher than engagement, it’s action. When you’re running a boosting campaign you are putting your messaging in front of an engaged audience. When you show interest-targeted ads to potential customers browsing Facebook’s newsfeed, they are more likely to click an ad link that refers them to your website for a positive impact on your ad spend. You can spend less per click on a Facebook ad, because of meticulously curated audiences and defined goals for each ad. Boosts = Prioritize Engagement & Visibility. You pay for engagement in the form of likes, views, comments and shares. Ad Campaigns = Prioritize Conversions. You pay only when people follow through with the objective of your ad. All other engagement is collateral marketing. To successfully market your brand on Facebook, you need to understand the difference between boosted posts and ads, and how to employ each to increase your ROAS. 3. Not defining the correct campaign objective for Facebook Ads. All marketing efforts must have an objective. How else would you be able to measure success? On Facebook, there are many objectives to choose from. Think hard about what you want qualified prospects to do with your ad. If you want them to go to your website, choose the “Traffic Objective” if you want them to watch your video, choose “Video Views,” but remember, the video view remains and the prospect stays on Facebook – they’re not referred to you your website where your products or services can be purchased. This may seem like a no-brainer, but you’d be surprised about how often less-than-optimal objective is defined and business owners are left wondering why they aren’t seeing the return they had hoped for. When you do not pick the correct objective, you may be paying a much higher average cost per unique link click, wasting valuable budget. 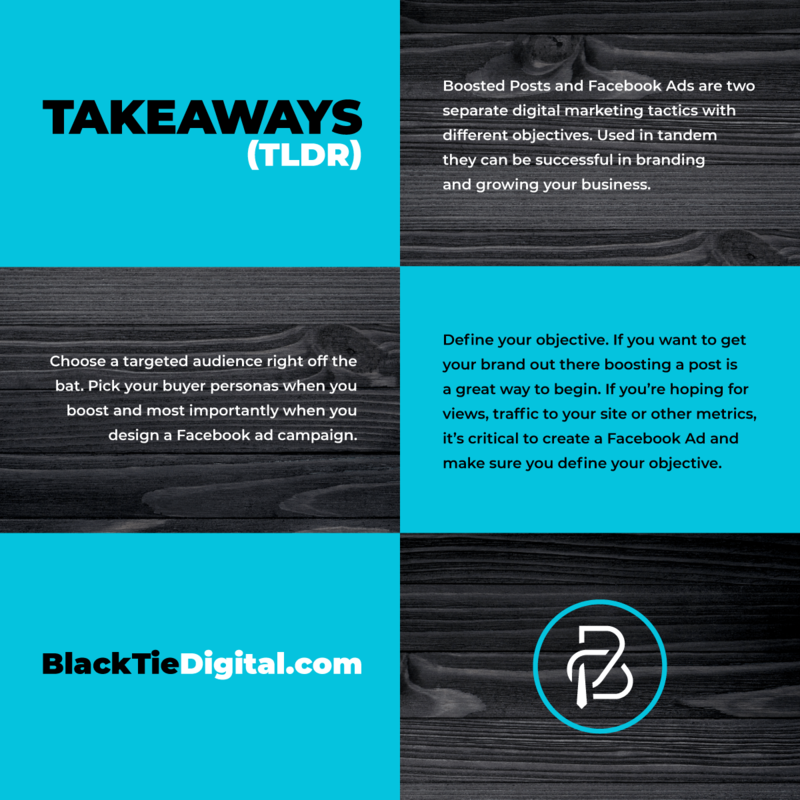 By choosing the best objective and audience, Facebook can put your ad in front of users who are likely to engage with your ad and fulfill your objective. When all the pieces of your Facebook marketing campaigns are firing on all cylinders, you’ll find that the most powerful ad-server in the world that not only drives more customers to your website but expands your company’s following of engaged fans.